Commissioners of Public Works of South Australia. Top, centre Major Freeling. Top row, left to right: Sir Samuel Davenport; Hon. Arthur Blyth; Hon Thomas Reynolds; Alexander Hay; Philip Santo; John Lindsay. Second row: Sir William Milne; William Townsend; Francis S. Dutton; Thomas English; William Everard; Hon. John Colton. Third row: F.E.H.W. Krichauff; Hon. John Carr; Hon. James Garden Ramsey; Wentworth Cavenagh; Henry Edward Bright; W.A.E. West-Erskine. Four row: His Honor Mr Justice Boucaut; Hon. G.C. Hawker M.A. ; David Bower; Hon. Thomas Playford; Sir Jenkin Coles; John Darling. 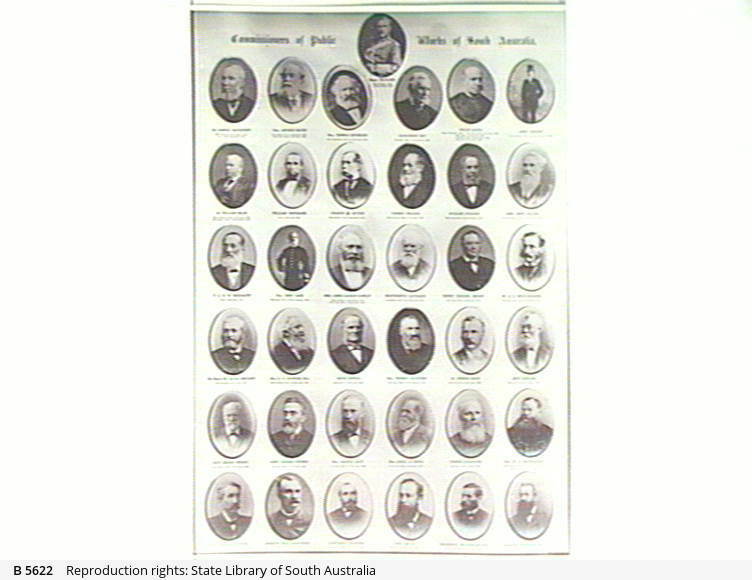 Fifth row: John Brodie Spence; Luke Lidiard Furner; Hon. Alfred Catt; Hon. James H. Howe; Thomas Burgoyne; Hon. W.B. Rounsevell. Bottom row: John Greeley Jenkins; Andrew Dods Handyside; Lawrence Greyson; John Moule; Frederick William Holder; Richard Witty Foster.